All writing and photographs © Bryna Hallam, unless otherwise noted. There is peace in the Great Bear Rainforest, but it is a tentative peace. Over the past four years, stakeholders—local communities, logging companies, labour, tourism and conservationists, among others—have sat down and banged out a land-use plan for the Central Coast, also known as the Great Bear Rainforest. Located along B.C.’s coast between Bute Inlet and the Alaskan border, the Great Bear Rainforest is the last, largest stand of intact temperate old growth rainforest in the world, as well as the largest contiguous area of unprotected rainforest. It has been nearly two years since those groups completed the first of two consensus agreements on land-use in the Great Bear Rainforest. Those agreements were followed by direct negotiations between provincial and First Nations governments in order to finalize the plan. Although far from perfect, the plan is significant: it marks the first time the different sides have agreed on pretty much anything. They’ve come up with a plan, but now it is all at risk, thanks to the provincial government, who missed a self-imposed December 2004 deadline for approving the agreement. Two additional deadlines—Spring 2005 and “end of summer”—have since passed, and stakeholders are worried there is more than the agreement at risk: much of the funding was promised based on approval. If it takes any longer, that funding might just disappear. Roughly 8.5 million hectares of ancient cedar, salmon, wolf and bear habitat in the temperate rainforest are at stake, along with a billion dollars in wood and wood products sales and $200 million in financing for conservation-based economic initiatives. Even more than that, 10 years of work at changing how environmentalists, industry and First Nations interact could be undone. Heralded by Time magazine in 1999 as “the number one environmental issue on the planet,” the Great Bear Rainforest is home to dense grizzly populations, rich salmon runs, and the rare white spirit (kermode) bear. The area is also home to 41,000 First Nations people. For many communities, this agreement represents a sustainable way of doing business. Klemtu Tourism, for example, is an eco-tourism business owned and operated by the community of Klemtu, the only occupied village in Kitasoo/Xai’xais territory. Loveless also says the agreement will attract the proposed conservation funding that will help put tourism on the same footing as forestry and aquaculture. Twelve years ago, protestors focused on another rainforest and took to the woods in Clayoquot Sound in the largest act of civil disobedience in Canadian history—900 people were arrested. Eyes turned towards B.C. and awareness about logging practices in the province spread. The Clayoquot protests paved the way for action on the Great Bear Rainforest. Blockades sprung up across logging roads, halting work for weeks at a time; consumers around the globe urged the B.C. logging industry and the government to adopt sustainable forest practices; and pressure on companies by environmental groups started to have an effect. Over 80 companies, including Ikea, Home Depot, Staples and IBM, committed to stop selling wood and paper products made from ancient forests. In addition, German pulp producers and magazine publishing associations supported limited logging in the Great Bear Rainforest and urged companies, environmentalists and the provincial government to find a shared solution. The quest for a solution was plagued with problems from the beginning. In 1996, when the B.C. government initiated the Central Coast planning table, set up to determine future land-use on the Central Coast, environmental groups refused to participate because the scope of the land-use planning was limited to current approaches to forestry and economics. They denounced the planning table as a “talk and log” process that would not change anything. It was not until two years later that environmental groups came to the table for the Central Coast Land and Resource Management Planning process in exchange for a temporary moratorium on logging in large intact rainforest valleys. 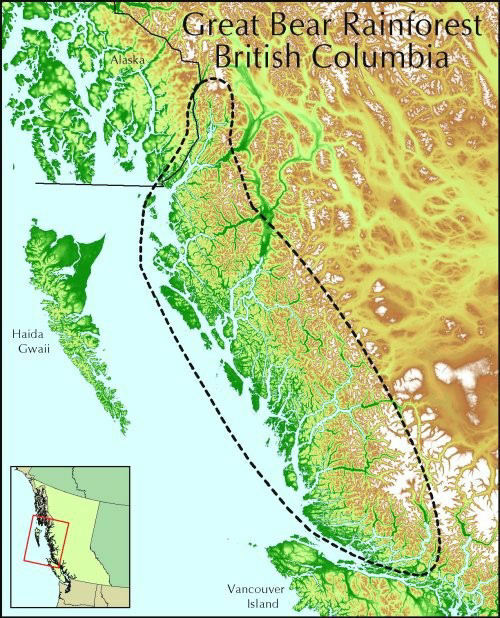 Four environmental groups—the Coastal Rainforest Coalition (now ForestEthics), Greenpeace, Rainforest Action Network, and the Sierra Club of Canada, B.C. Chapter—negotiated with four major coastal logging companies—Interfor, Western Forest Products, WestFraser and Weyerhaeuser—plus two pulp companies, NorskeCanada and Canfor, to extend the moratorium to all intact rainforest valleys in the Great Bear Rainforest for the duration of the land-use planning phase. With the groundwork laid, it seemed the real work could finally start to happen. On April 4, 2001, after four years of meetings, the B.C. 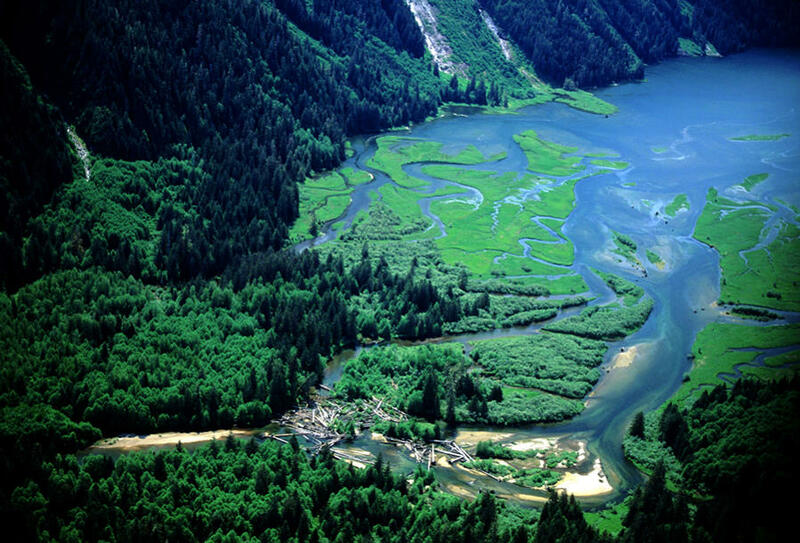 government, First Nations, industry, environmentalists, and local communities agreed to create protected areas and to explore how ecosystem-based management (EBM) could be used in the coastal rainforest. This historic agreement signaled a landmark level of commitment to environmentally responsible forest practices and planning. The B.C. government, the forest industry and environmental groups committed $4 million to establish a “blue ribbon” science panel—the Coastal Information Team (CIT)—tasked with developing standards for EBM in B.C.’s coastal rainforests. The purpose of EBM is to achieve healthy ecosystems and healthy human communities that can coexist—because ultimately humans cannot be sustained unless ecosystems are sustained. As the CIT points out in its review report, people may benefit in the short term if ecosystems are put last, but eventually they will suffer. If ecosystems are put first, human wellbeing will be secure; however, if socioeconomic needs are not met, ecosystem protection is likely to fail. As a result, maintaining ecological integrity and human wellbeing requires a strong emphasis on both. EBM’s guiding principles are to maintain ecological integrity; promote human wellbeing; sustain cultures, communities and economies; recognize Aboriginal rights and titles; apply the precautionary principle; and ensure people have a fair share of the benefits of their ecosystems. The key elements of EBM planning include conservation planning, socio-economic planning and risk management. EBM sounds like a near-perfect plan for sustainable land-use. Of course, that would depend on whether or not the CIT’s scientific recommendations were followed. That’s where things seem to have gone wrong. While the agreement itself might be groundbreaking, there is some question as to whether the contents of the agreement are as significant. Despite all the money funneled into CIT by the government and others to get the “best science available,” their recommendations haven’t always been followed. For example, CIT recommended that at least 44 per cent of the area should be protected; in the most recent proposal, only about a third of it actually will be. In addition, CIT’s recommendations have been adopted only as a guide, not as legally binding changes to the way natural resources are used. This, says the David Suzuki Foundation, means that government and industry can continue to exploit natural resources. This has become one of the biggest criticisms of the Great Bear plan. Unfortunately, a decision was made by some in the environmental community to drop the hammer and sit down and try to negotiate with the companies. This was and remains a mistake because it unfortunately legitimizes the actions of these companies. Many groups contend that the level of protection is insufficient to protect species over time. In a study commissioned by Raincoast, bear biologists Dr. Brian Horejsi and Dr. Barrie Gilbert show that 80 per cent of grizzly bear habitat will remain unprotected in the land-use plan. In addition, says McAllister, the majority of proposed protected areas allow trophy hunting of wolves, and grizzly and black bears. He claims the plan also fails to follow the precautionary approach—that actions suspected of being harmful should be banned unless they are proved harmless—as called for by EBM principles. “We would like this plan recognized for what it is—a land-use plan that is based largely on political and economic interests not in science and ecological processes,” said McAllister. McAllister believes that involving timber companies in the planning doomed the process to failure. According to a report by the David Suzuki Foundation, logging has continued in the Great Bear. And because of the delay in approving the negotiated land-use plans, logging continues under the current regulations of the B.C. Forest Act and the Forest and Range Practices Act, which are a far cry from the EBM that the CIT called for. Since the 2001 agreement, over 300 cut blocks have been logged in the Great Bear Rainforest; 74 per cent of logging is done by clearcutting, which removes 70 to 100 per cent of the trees on a specific logging site. Timber companies got involved with the plan through the Joint Solutions Project, an initiative formed by nine environmental groups and forestry companies to collaborate on finding new solutions to longstanding environmental disagreements in the Great Bear Rainforest. “It has been an amazing transformation to see two divergent interests find a way to partner together on land-use recommendations in Coastal B.C. that makes sense for both the environment and forestry,” said Ric Slaco, Vice-President and Chief Forester of Interfor, in March. Those new perspectives are based on a plan that hasn’t yet been approved, and that’s causing some problems for industry, as business people and buyers are wondering why things haven’t changed yet. Forestry representatives claim they are ready to adopt EBM principles—if only they would be passed into law and made clear for those on the ground. Though he believes the plan is flawed and “should only be considered a first step towards the goal of protecting the Great Bear—not a final solution,” Raincoast’s McAllister wants to see it approved by government. “We will maintain our efforts in securing more protection,” he said. We wanted to meet the recommendations of the scientists, but we couldn’t. According to Matthaus, the only reason the environmental groups are agreeing to the plan and continuing to be supportive is because it is a package of protected areas and a commitment to implement EBM by March 2009. And as it stands, those involved have agreed. What remains is government approval.